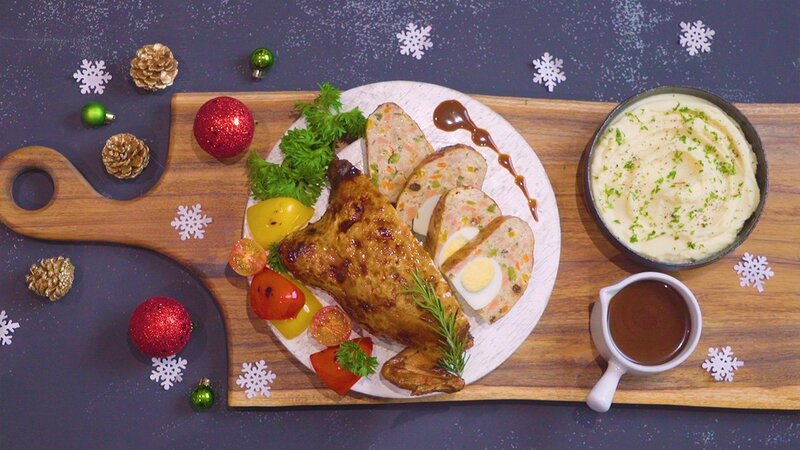 A Filipino-inspired roast chicken with a juicy meat stuffing that’s paired with a flavorful gravy, and creamy mashed potatoes – a perfect Christmas meal for your diners to share joy with their family & friends! Mix the Soy Sauce, Lemon and Salt and Pepper in a bowl. Place the deboned whole chicken in, and let it marinade for 30 minutes for added flavor. Mix together all the filling ingredients (except the Hardboiled egg). Make sure it’s all mixed well, without crushing the sausages. The raw egg will serve as a binder for the meat mixture. Remove the chicken from the marinade. Carefully fill the cavity of the chicken with the stuffing, placing the peeled Hard-boiled eggs in between layers of stuffing. When finished, tie the chicken legs together with kitchen twine securely to cover the cavity, and prevent the stuffing from leaking out. Massage a generous amount of butter on the chicken, place on a roasting rack, and roast in the oven for 45 minutes to an hour, or until the chicken is cooked. In a pot, add the butter and shallots, and cook until the shallots are fragrant and semi-transparent. Add Knorr Demi-Glace and mix until it boils. Combine all three ingredients and fold it together, without over mixing. Season with KNORR Chicken Seasoning Powder and pepper to fit your preference. Place the creamy Mashed Potatoes on the plate and slice the Chicken Galantina carefully from the side opposite the cavity. Place the slice of Chicken Galantina on top of the mash, and drizzle with your Demi-Glace Brown Sauce Gravy.